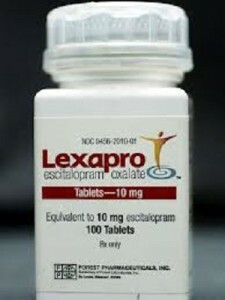 Lexapro is an antidepressant used in the treatment of anxiety and depression. It was designed by Danish pharmaceutical company H. Lundbeck A/S and licensed for marketing in the U.S. by Forest Laboratories. Lexapro received approval from the Food and Drug Administration (FDA)in August 2002 and is currently approved as a treatment for major depressive disorder (MDD) in adults and adolescents and generalized anxiety disorder (GAD) in adults. The drug is also sometimes prescribed off-label by healthcare providers to treat other psychiatric disorders, such as bipolar depression, panic disorder, obsessive compulsive disorder, and post-traumatic stress syndrome. However, citing “serious” Lexapro side effects such as suicidal ideation and actions, and manic episodes, the FDA does not approve these uses. Lexapro belongs to a category of drugs called selective serotonin reuptake inhibitors, or SSRIs. These drugs work by limiting the absorption of serotonin by brain cells, thus increasing the overall amount of serotonin in the brain. It is thought that low serotonin levels are a primary cause of major depression, although the exact relationship between serotonin and mood disorders is not yet completely understood. Individual genetics play an important role in the effect SSRIs will have on any particular patient, and often doctors will need to alter dosages or switch from one antidepressant to another in order to achieve the desired clinical effect while minimizing SSRI side effects. Some Lexapro side effects, such as nausea and dizziness, are the result of the body’s adjustment to the drug and usually resolve on their own. Other side effects, such as sexual dysfunction, may be longer-lasting or even permanent. Lexapro birth defects have been alleged by children and mothers who were exposed to Lexapro during pregnancy. However, there has not been enough study of Lexapro and pregnancy to warrant any serious precaution against it. The FDA rates Lexapro as pregnancy category C, meaning that it may be used by pregnant women if the patient’s doctor judges that the benefits of the drug outweigh its risks. SSRIs have been shown in clinical studies of major depressive disorder to cause an increased risk of suicidal thoughts and behaviors in children, adolescents, and young adults under the age of 24. As a result, Lexapro bears a boxed FDA warning indicating that the drug should not be used in pediatric patients under 12 and that its use in adolescents and young adults should be monitored closely. Parents and caregivers are urged to closely observe and communicate with Lexapro patients and report any worsening of depression, suicidal thoughts or actions, or unusual changes in behavior. Serotonin syndrome, or serotonin toxicity, is one of the most dangerous Lexapro side effects. This condition occurs when too much serotonin in the brain produces potentially fatal neurological side effects. Serotonin toxicity can occur from Lexapro alone, but is more likely if the drug is used in conjunction with certain other drugs that increase serotonin levels, including certain other types of antidepressants. Lexapro and other SSRIs may increase the risk of abnormal bleeding events, ranging from minor bleeding side effects to life-threatening hemorrhages. SSRIs particularly increase the risk of gastrointestinal bleeding. The risk of bleeding is increased when Lexapro is taken with other anti-inflammatory drugs or anti-coagulants, such as warfarin, aspirin, or other NSAIDs. Studies show that newborns exposed to SSRIs late in pregnancy may experience disorders such as agitation, abnormal muscle tone, abnormal suction during feeding, seizures, and hyponatremia. Other Lexapro birth defects, such as heart defects, malformations of the skull and abdomen, and persistent pulmonary hypertension of the newborn (PPHN) have been reported. Because of these side effects and risk factors, the FDA urges doctors to carefully weigh the risks when prescribing SSRIs such as Lexapro to pregnant women. The most common Lexapro side effects in newborns are tied to either infant serotonin syndrome, in which the infant’s serotonin levels are abnormally high, or to neonatal abstinence syndrome, in which the infant suffers from withdrawal symptoms after the drug leaves its system. Forest Laboratories is facing many Lexapro lawsuit actions in the U.S. related to Lexapro. Fifty-seven cases have been consolidated so far in federal court in Missouri, revolving around claims of suicide or attempted suicide by patients taking Lexapro. An additional nine cases in Massachusettes center on Forest’s illegal marketing of Lexapro and Celexa to pediatric patients despite the increased risks, a crime which the company pled guilty to in a federal criminal lawsuit which was settled in 2010. Children and parents of children who were born with Lexapro birth defects or other SSRI birth defects, patients who sustained other Lexapro related injuries, and the families of patients who committed suicide, are engaged in widespread litigation to recover compensation for their losses or injuries.